Selling premium WordPress themes can be done in a variety of ways and there are many online markets which can help you do just that. You might consider submitting your theme to WordPress.org theme repository if you’re looking for initial exposure, backlinks and brand recognition, or you can use your own website for WordPress theme marketing purposes, if it’s already well established. Providing that you want to build and sell a theme that will be rich in features and have outstanding design with all the little details cleverly thought through, I highly recommend ThemeForest. ThemeForest is Envato’s most profitable marketplace that specializes in selling premium WordPress, Magento, Joomla, Shopify, Tumblr, PSD, HTML, email and other templates. Envato is an Australian based company founded in 2006 which committed itself to producing high quality items, so be sure that you match their criteria before you decide it’s time to make some money for the time and hard work you’ve invested. They also have a wide array of blogs where you can find tutorials on how to develop and use your creative skills to your full potential. 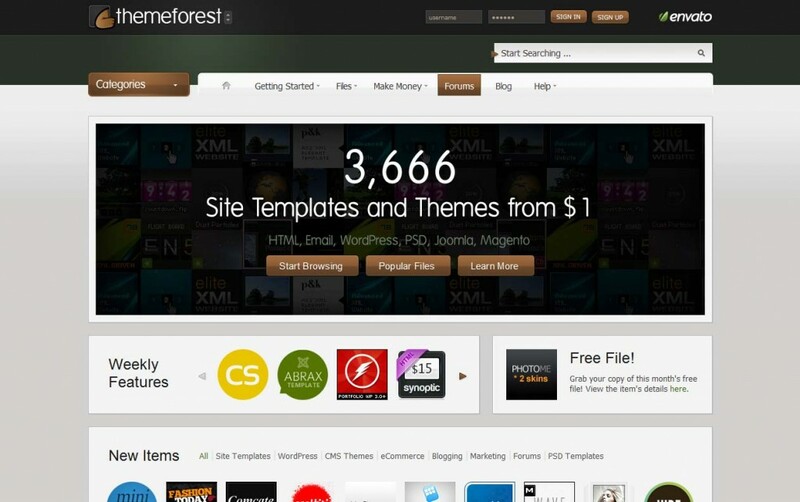 ThemeForest ensures that your work will get the visibility it deserves since they’ve established themselves as a go-to marketplace for the vast majority of template-loving clientele. You can focus on your work and not worry about transactions or your WordPress theme marketing. Envato marketplace authors make between 50% and 70% on every item sold, which means that you are deprived of at least 30% of your earnings, which may seem a lot, but when you think of the marketing exposure ThemeForest provides it doesn’t seem to be so wallet hostile anymore. Prices range from $12 to $60 for WordPress templates, based on the overall quality and complexity of a file and determined by Envato staff. or you can search for a specific template using keyword search which is basically entering the name of the theme or author you’re looking for in the search box. Payment is done by PayPal or loading funds using your credit or debit cards and after it’s concluded you may download your chosen item straightaway. If you’re considering building a premium WordPress theme yourself, ThemeForest will be invaluable source of inspiration, knowledge, and an overall reference point. It’s such a vast community that most of the times you won’t have to look elsewhere, as you’ll be able to extract the best out of multitude of templates, improve the things you think others could have done better or simply discard what you think is mediocre. The thing I found most interesting about ThemeForest is that it helped me gain a certain perspective on the functionality and design of websites. Once you start developing that perspective you can dive into your own endeavor. If you wish to read about my perspective in detail, about the authors, designs patterns that capture your eyes at an instant and about most sought after features that make certain premium WordPress themes do better that others, then stick around for my future posts, as I’ll go up close and personal with this unique marketplace. Hi guys I just stop by to wish you luck with your startup. I noticed from your names that you come from some ex-yu county, and I myself come from Macedonia, and I’am trying to start my internet company. So I’m following your blog in the few months and I like your ideas for building company, and it gives me hope that even in this part in the world there can be successful young people. Best wishes, Dimitar. Thank you so much for your kind words Dimitar! We wish you a lot of success with your startup as well and please keep us posted on how it goes. P.S. Just being curios, how did you find this website? I found your site from comment post on 37signal’s blog. Some of you posted comment with full name which caught my attention (sounding like Serbian name). I regularly read their blog, actually I like 37signal’s tips for starting online business. I got my idea for internet business from their book Getting Real. I highly recommend this book for people how like to start their own business. So if you haven’t read it already, you can read it online for free. By the way me and my friend are building SaaS based software, and we are in early stages of development, so in near future we will set up blog and twitter account, and I will post it here. Greetings, Dimitar. Hi Dimitar, good to hear from you again. We also tend to read 37signals’ blog because it offers very pragmatic business ideas. As a matter of fact, we embraced our business policy from another 37signals’ book – “Rework”, which I highly recommend. I, myself never got the chance to go through “Getting Real”, because it’s oriented towards web-app programmers, but I’m convinced that it’s a great read and that it carries very sound ideology which can be implemented in almost every niche. Thanks for reminding me of that book, as I’ll put it high on my priority list. Again, I wish you and your project all the best, and I hope you’ll set up your blog and twitter account as soon as possible and let everybody know about your plans and products even before they’re finished, just as people in charge of 37signals did. I’ve read it Rework, I forgot to mention it in my previous post, and I am glad you like it. I’am very interested in online payments and e-commerce, so how do plan to accept payments online, do you have merchant and payment processing gateway in your country, because in my country there are very limited offer (actually only one payment gateway with high fees) for this services, or you plan to use services like Moneybookers or something similar. So glad you took further interest in the whole process of earning and doing business online, but we got a little off topic, so I’ll answer you via email.